Kpreps.com would like to congratulate Susan Goodwyn for submitting the winning photograph for Week 7 of the Kpreps Friday Night Photo Contest. 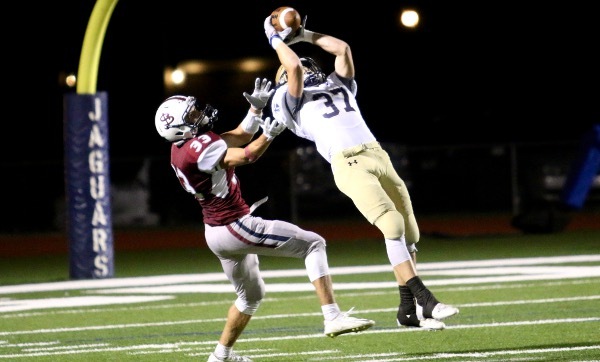 Susan’s photo captures Shawn Doherty (37) of St. Thomas Aquinas intercepting St. James Academy quarterback Sammy Wheeler in front of Thunder receiver Jackson Diel (33). Aquinas won the battle for the Hibernian Cup 24-7 over the Thunder. The Saint’s defense held Wheeler to 4 of 17 passing for 60 yards, a touchdown and Doherty’s interception. For this winning photograph, Susan is again eligible for our 2016 Grand Prize including $500 in cash. Each week during the regular season and playoffs, Kpreps will select a winning photograph that will become eligible to win the grand prize. This means there will be 13 photos chosen as finalists for the 2016 contest. Only weekly winning photographs will be eligible for the grand prize!